Filed to: San Francisco Raiders?Filed to: San Francisco Raiders? For the 2019 season, the Raiders may stick with a familiar look for their temporary home field: a baseball park. NBC Bay Area’s Raj Mathai reported that there was “a distinct possibility” that the Raiders end up playing at AT&T Park in the season right before the franchise’s move to Las Vegas. Al Saracevic and John Shea of the San Francisco Chronicle confirmed that the Raiders have had “preliminary discussions” with the San Francisco Giants over the subject. AT&T Park isn’t a stranger to hosting football games. The San Francisco Demons of the XFL played five home games there in 2001. A college football bowl game was also hosted there from 2002 to 2013. The drawback there was that the park’s configuration forced both teams to share a sideline, with only a barrier at the 50-yard line separating the teams. Things were figured out in 2011 when the University of California’s football team called the park home for a season during California Memorial Stadium’s reconstruction and the opposing teams were on separate sidelines. Of course, because nothing involving this team can ever go smoothly, it appears that another NFL team could factor into this deal potentially falling through for this soon-to-be-homeless team. According to Ian Rapoport, the Raiders “can’t unilaterally move” to the park because it falls under the San Francisco 49ers’ territorial rights within the market. 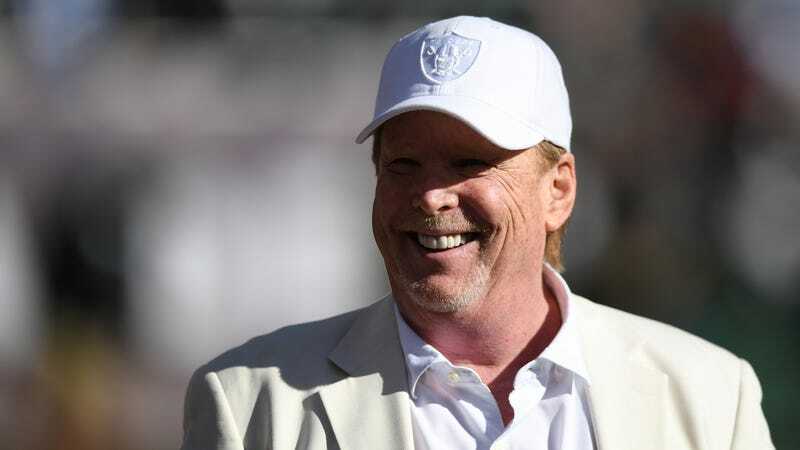 The Raiders are only in this particular situation because they pulled their lease offer with the Oakland Coliseum after the city of Oakland filed a federal lawsuit against the team, and the NFL, for the Las Vegas move. But, while talks have advanced with this location, nothing is confirmed and other options around California have circulated as potential destinations. None of the alternatives listed, however, are as conveniently, and scenically, located as AT&T Park. The Raiders’ time in Oakland appears to be coming to an end and the fact that the franchise can’t even get its greed-fueled exit right just makes perfect sense.